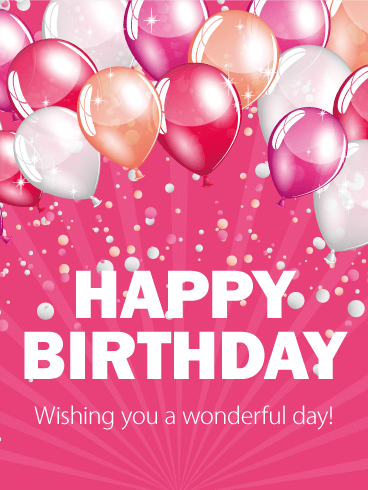 This cheerful, pink-colored Happy Birthday Card is just so perfect for sending to that special someone in your life! You know the one; the person that always responds positively and with a big, warm smile whenever you ask them how they are doing! Pearls, balloons, confetti, and a luscious layer cake complete the sweetness of this card all underneath the message "have a great day!" Your love has a unique sense of style. 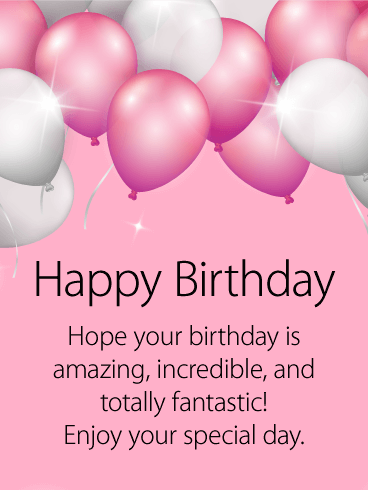 For her birthday, the contrasting blacks and pinks on this Happy Birthday card will delight her and show her how much you care about her! Your loved one is gorgeous on the inside and the outside - no one can compare to her beauty. For her special day, use her celebration to share your love for her with this great gift! One look at this fabulous, chocolatey three-layer cake, and the birthday guy or gal will be ready to party! This birthday card is the epitome of fun and excitement! Just look at those balloons, in the gorgeous pinks, purples, blues, yellows, reds, and greens! The background has a sort of watercolor element, adding to the beauty of this awesome birthday card. All birthday wishes welcome! There is no such thing as too many birthday cards! 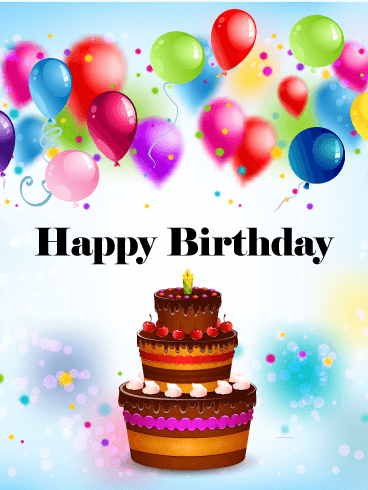 The birthday boy or girl should be showered with happy words and colorful birthday cards all day long from everyone they know. 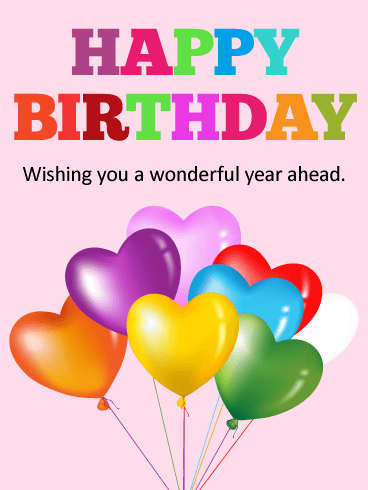 Don't wait another minute-wish a wonderful birthday to someone you know! 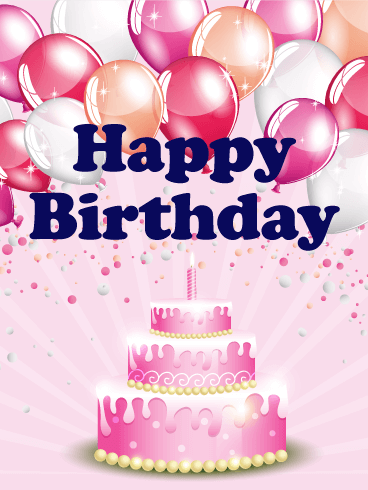 This pretty pink birthday greeting card is super fun and totally vibrant. 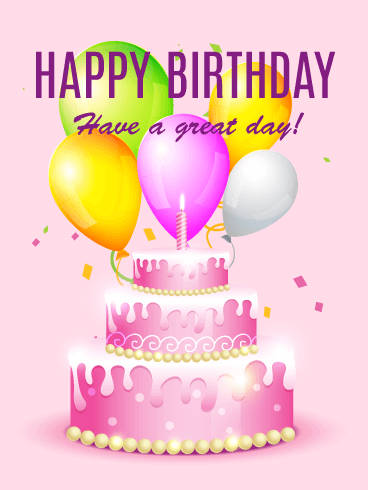 Send a smile; send a birthday card! Is there someone in your life important and special enough that you wish that you could celebrate them all year round? 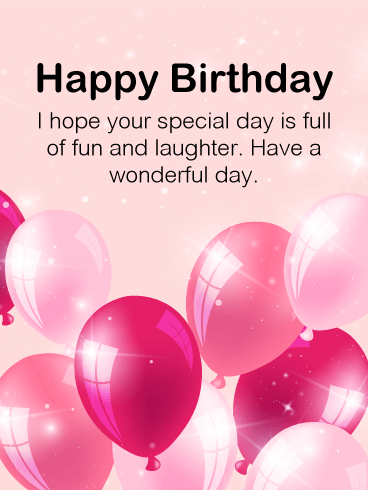 Then this card is for you! 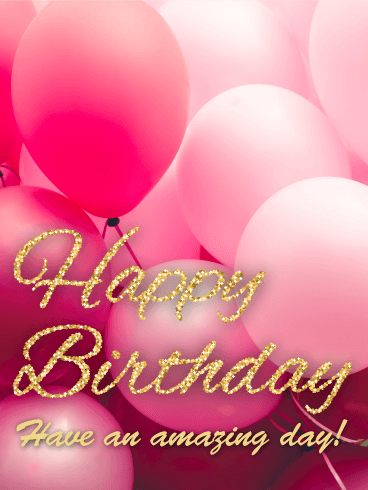 This sweet, delicate birthday card covered in pastel pink and rose-colored balloons and smattered with golden confetti will convey a short rhyme of important birthday wishes to your special someone on their big day. 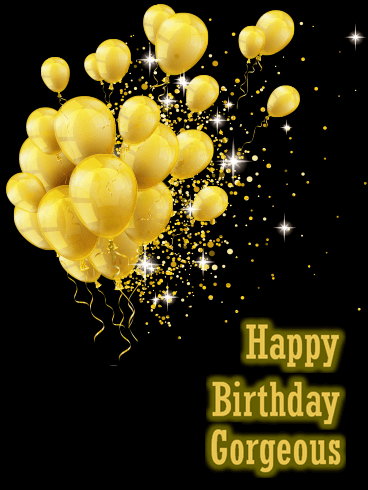 The gold glitter wording of this b-day card is sure to catch the eye of anyone celebrating their special day. 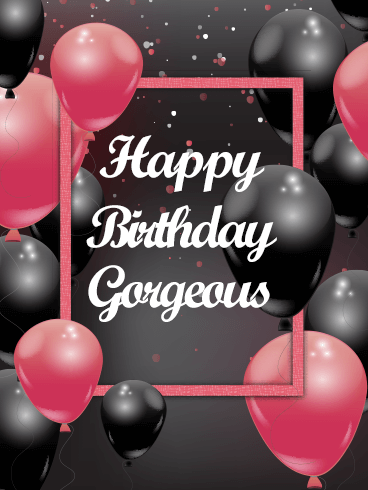 Whether it's for a sister, best friend, co-worker, or mom, this spunky and sassy b-day card is a great choice! The balloons scream, "Celebration! ", while the different shades of pink add the perfect element of girl power and beauty. We HEART birthdays! Let's hear it for the birthday girl! 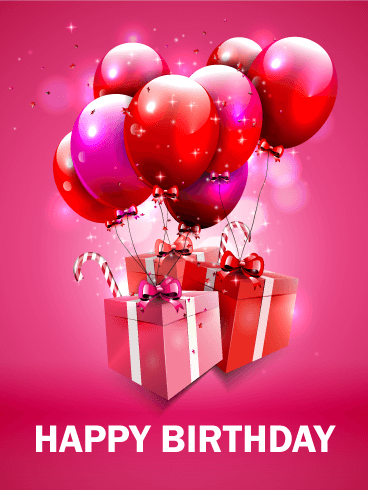 She will love this fantastic birthday greeting that is bursting with satin balloons and shimmering with confetti and love. Every balloon is a special birthday wish for the most amazing year yet. 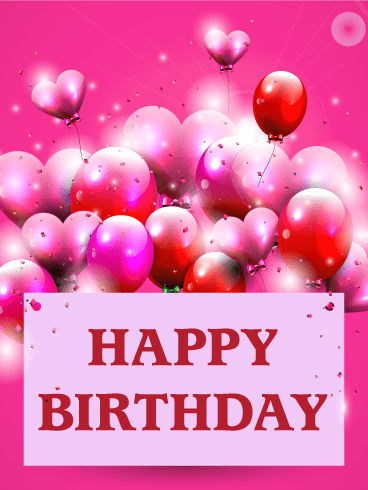 Celebrate someone's special day and send them a heart-filled birthday card now. This pink birthday card really rocks. Know a firecracker of a lady who's stylish and into modern design? Then this is the birthday card for her! 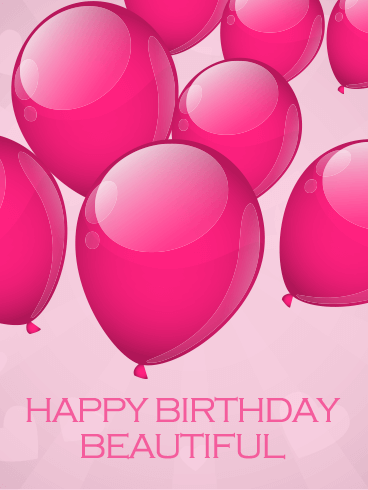 The pink, white, and blue polka dot balloons can't be contained behind the Happy Birthday banner. They're bursting out, just like your friend. 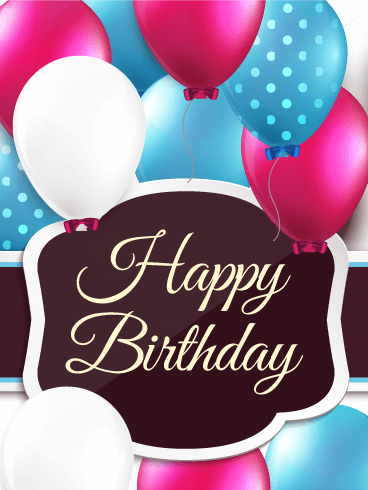 Send this birthday card to her to celebrate her special day! 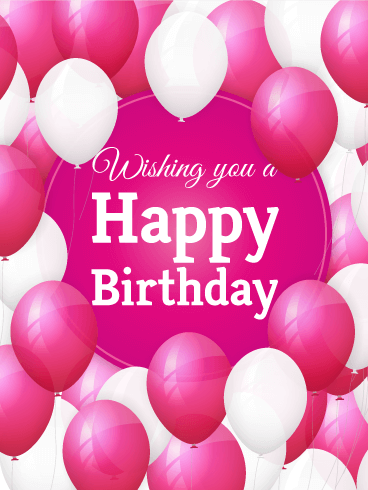 Dazzle and delight with this awesomely pink birthday card! Bring on the presents and bring on the smiles. This birthday greeting is absolutely fantastic! 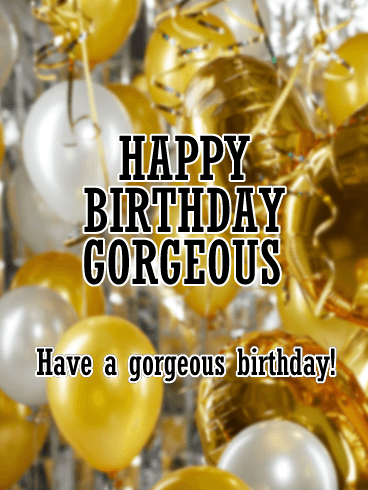 If you know a lady who really shimmers and shines, let her know with this special birthday card and send it to her today! Be outlandish in your love, go all in for celebration - birthdays only come but once a year! There is a reason balloons are a popular choice for birthdays! They remind us to be carefree and childlike, to enjoy the simple pleasures in life, and to fill our lungs with deep breaths and rise as high as our dreams can take us. 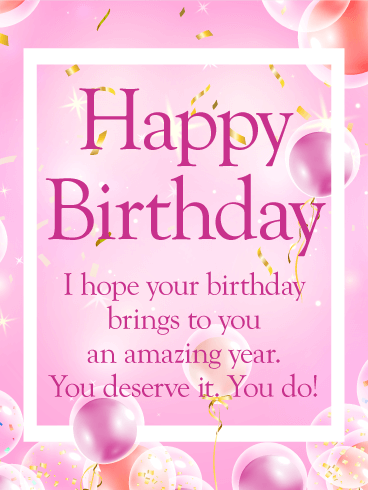 Send this lovely birthday card to a good friend today. 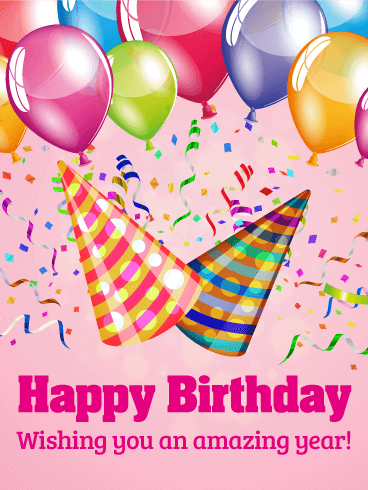 It is filled with pink and white balloons that float around a fun birthday wish. A birthday party can be the best party! After all, you've got friends and family around, there's bound to be balloons, laughter and music always abound... and, without a doubt, there's sure to be some sort of delicious, frosted, and candle-decked delight at some point! 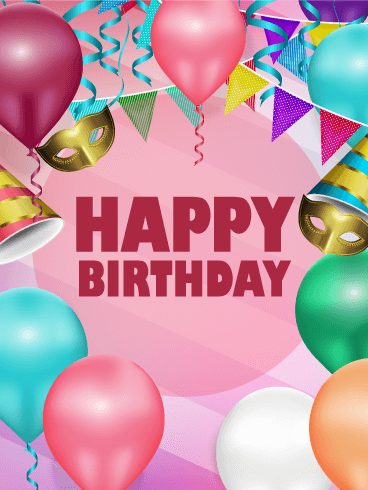 So make sure to bring along your best wishes for a great birthday with the help of this colorful and festive birthday card.